How many episodes of Ellen: The Ellen DeGeneres Show have you seen? Have a little fun today. Ellen: Make me dance Tony! Q: How many members are there in the show's audience? My mom and I watched Ellen last summer while we were at work. I loved it. I left for college this past year, and I still watch Ellen almost everyday. My roommate hated my love for the show at first, but after a while she really got into it. Now we both watch it. This semester I have an 1130 class and will have to miss Ellen, I don't know what I'm going to do! I love Ellen. She is so funny, I laugh out loud whenever I watch her show. She is so funny and I love how she interacts with her guests. I also love the dancing. I would go see Ellen live in a heartbeat, she brightens my day! Her guests are so wide. She had Kanye on the other day, and then before that she had stars from Lost! Anyone can have fun on Ellen, and I think that most of the stars do! 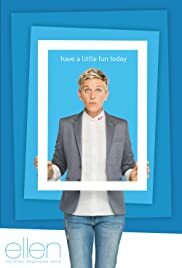 My roommate said that this coming semester we are going to try and get an Ellen watching party everyday, even when I have to go to class. We want everyone to enjoy Ellen just as much as we do! 7 of 23 people found this review helpful. Was this review helpful to you?